Cooking, when done right, is a splendid activity. I enjoy it quite a bit. Especially baking, which is really another facet of cooking. An extension. Some recipes I have tweaked, and made my own. Others I have made so many times I have them memorized. But for the majority, I consult books, and I favor the kind that assume I already know how to use a bread knife. I prefer to be spoken to, not at. This is not to say that there is not a certain use for those types of books that decipher each element of cooking, meticulously outlining every step. There are in fact people out there who do not know the difference between a cheese grater and a potato peeler. Everyone has to start somewhere. But once you have moved past the identifying kitchen utensils step, it is quite nice to read a cook book and feel as though you are having a conversation with it. You are not, but it can be enjoyable to feel as though you are. What I mean is that I like the kind of book that sounds conversational. “Peel and cut the tomatoes and add a dash of salt.” You will notice that no part of this is precise in any way. The size of these tomatoes is left just as ambiguous as the method of cutting. Dice them? Chop them? Well, you can try, but I will tell you right now that peeled tomatoes do not respond well to either of those maneuvers. What you are basically going to do is smash them into chucks with your knife and throw an undiscriminatory amount of salt at them. As for the salt, well that depends on how you feel, and who you are serving, etc. etc. 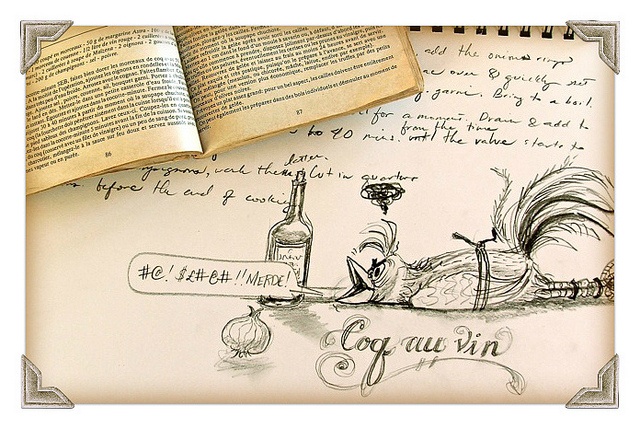 The kind of cook book that will be as lax with salts and spices is written by someone writing, not necessarily cooking. The cooking seems to be a byproduct of the writing. It sort of happens. You read for the entertainment of reading, and at the end of it all you have dinner ready. With just the right amount of salt. And the writer was never pretentious enough to surmise that they know how much salt I like. And I will put in just a little, as to not offend anyone (salt can be very offensive!). Then I will delicately place the salt shaker within reach, should anyone care for more. Since no one seems to know how much salt anyone else wants, it is advisable to just leave it sitting about. A good cook book will have pictures of salt and pepper shakers for this very reason. As a reminder. However, said cook book will have few other pictures. 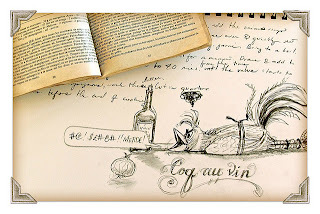 It may include a hand drawn silhouette of a Coq au Vin, but not the actual shot of it. Realistically, even following the most pedantic instructions will not yield a dish that looks like the one in the picture. Yours will be a little lop sided, maybe a tad uneven at the top. The color will be ever so slightly off. You would not know any of this if you never saw the pictures. Now you are comparing, and criticizing. The cook book that is trying to have a conversation with you most certainly does not want you feeling bad about yourself. And no one wants to eat a dish that has an inferiority complex. And I realize I am describing more of a cooking novel, narrating the process rather than describing and prescribing as a traditional cook book does. But you see, these sorts of books do exist. They used to be the norm. It was never expected that we carry measuring cups in half-a-teaspoon increments in our purses or pockets. There is a reason for the term “culinary art,” and it doesn’t have to do with painting by number.